Rear services are an inseparable part of the armed forces of the country. This includes units, large units and rear service installations combined with storage sites for supplies and equipment, which are to form an organic part of units, large units, and operational entities. This includes units, large units and rear service installations directly under the control of the central organs of the rear services. 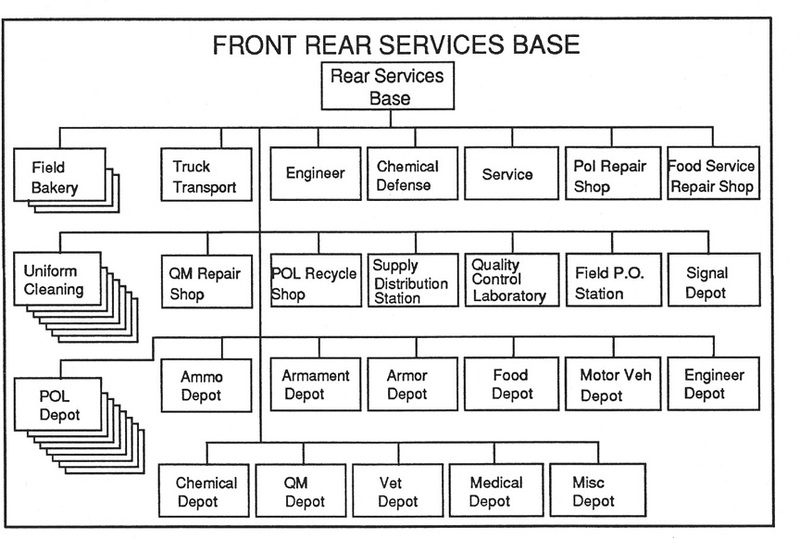 Rear services may be divided into three distinct categories: rear services of the forces, operational rear services, and rear services of the center. This includes rear service units and subunits, which have control of mobile storage assets and form an organic part of major units, units, and subunits, and whose mission it is to provide direct supply, and technical and medical support under any type of conditions or circumstances. This includes rear service units, major units, and installations, which form an organic part of operational entities and are assigned to provide all around rear service support for the forces. The operational rear services includes the front rear services, navy, military district (okrug) and PVO district, district, army rear services (missile, infantry, armor, air forces, air defense), air forces, naval air and naval bases. Organization of the operational rear services is not fixed and depends upon the combat composition, mission of operational entities, and the combat environment in the theater of strategic military action. This includes large units, units, and rear service installations, which are directly subordinate to the Main Administration of the Center, Ministry of Defense and the branches of the armed forces. During peacetime, all support in the form of armed forces supplies, missile propellants, POL, rations, clothing, pharmaceuticals, as well as medical support are provided by a single system of supply services of military districts and groups of forces. During wartime, the above services are provided through the front rear services organization, by using military district facilities (units and rear service installations) and by taking advantage of local assets. Rear services support consists of a number of measures concerning the organization of the rear services, preparation and utilization of the communications routes and transportation means, and provision of materiel, technical, medical and other types of support and services to the troops. In front operations such support is provided by the rear services of the troops, armies and front. The rear services of the troops and of the armies are completely mobile and maintain the following amount of supplies: in a division, for four to five days; in the army, for six to seven days of combat action. - performing the tasks concerning veterinary and quartering services of the troops and the utilization of local and captured resources. The troop control of the front's rear services is exercised by the front commander through the front staff, the deputy front commander for rear services, and the chiefs of services directly subordinate to him. The staff of the front rear services and the following chiefs of services are subordinate to the chief of the front's rear services (deputy front commander for rear services): chiefs of: motor transport service, motor routes, military communications service, POL supply service, medical service, foodstuff supply service, clothing supply service, veterinary service, quartering service, and military trade service. - condition of the battle with and without the use of nuclear weapons. - other rear service units. - rear service security (guard) units and large units. In addition, special loading and unloading facilities and specialized facilities of communications routes may be allocated to the front. The responsibility for timely supplying of the troops with weapons, combat vehicles and equipment and other materiel means belongs to the chiefs of arms and services. This should be taken into account in organization of the rear services support in front offensive operations. The forward front bases are designated to maintain a specific amount of materiel reserves and insure their timely delivery to army (troops) bases. They are also assigned to conduct repairs of clothing, equipment, vehicles, and large assemblies of POL and food service technical equipment. They also reprocess POL reserves, provide laundry service, and supply bread. Front bases are self sufficient in transportation means even when they are located far away from railroads. They can move to new locations by their organic transportation means. The capacity of supplies maintained in a forward front base is 7,000 tons which can supply supported troops for three to four days without outside replenishment. Each forward front base can supply one to two armies and the front's units and large units, the support of which is assigned to the forward base. 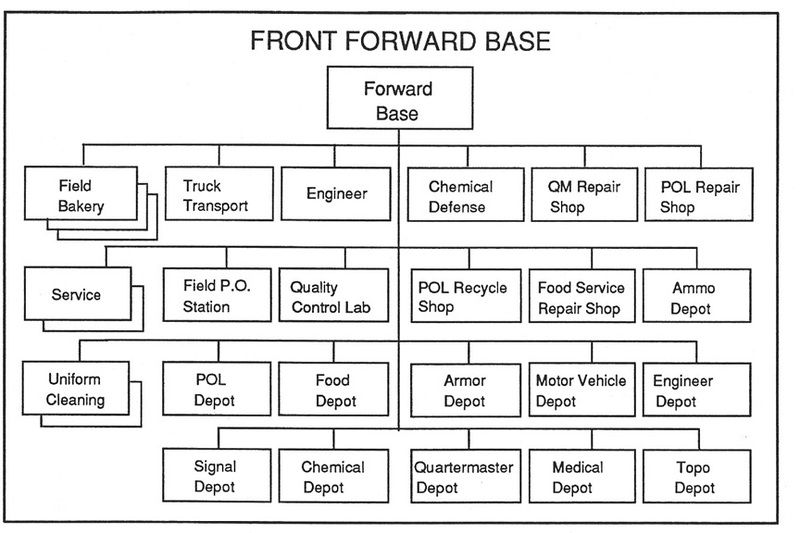 The forward front base consists of a base headquarters, one depot for each type of supply item, two independent service companies, an independent rear service engineer company, an independent rear service chemical protection company, three mechanical field bakery plants, maintenance facilities to repair the equipment of the POL supply service, as well as large technical equipment of food and clothing supply services, a mobile POL reprocessing station for motor fuel, two mechanical field laundry detachments, a materiel testing laboratory and military mail station. - six senior assistants to the base chief in the following areas: armament and ammunition supply, POL, armored supply, motor and tractor supply, food and clothing, and combat equipment. The signal communications for the forward front base is provided by its organic signal company. * One wagon is the equivalent of 20 tons. The depots are subordinate to the front chiefs of related services in matters concerning security measures, resupply, preparation for the delivery of supplies to the troops, utilization of special equipment, accounting, and organization of expenditure of supplies. The motor transport regiment of the forward front base is designated to transport the supplies kept in the base, to supply materiel means, evacuation, and other transportation tasks in accordance with the plans of front rear services staff. The motor transport regiment can lift 3,300 tons of supplies in one trip. These companies are appointed to do the loading and unloading, to provide security, traffic regulation, and to support the troops operating in the base. One service company can load and unload up to 2,500 tons in a day. The company is designated to prepare shelters and covered dispositions for personnel, supplies, and vehicles. The company is appointed to conduct chemical and radioactive reconnaissance, as well as to eliminate the impact of mass destructive weapons. The rear front base is designated to hold materiel reserves and ensure their timely supply to the forward front bases or their subsidiaries, as well as to the troops operating in the front rear services area. The rear front base (rear services base) also conducts repair of equipment, large assemblies of the equipment belonging to POL, clothing, and food services, supplies bread, reprocesses POL, and provides laundry service for the troops. The rear front base is normally deployed on the main railroads (at rail heads), or in the vicinity of ports and harbors. The headquarters of the rear front base is designated for troop control of the base. Its structure and organization are similar to the forward front base headquarters, which was discussed in the previous pages. In addition, there is a troop control section of the base with an attached signal platoon. Each depot can detach two branches. The depots are subordinate to the chief of the rear front base and the front chiefs of services in the same way as was mentioned in the case of the forward front bases. The permanent and stationary depots located in the front rear service area can also be included in the composition of the rear front base area. This unit is designated for internal transportation in the base area. In some situations it can also be employed in transportation of supplies to the troops for a short time in accordance with the front rear services plan. The battalion can lift in one trip 1,100 tons of supplies. This unit is appointed to conduct loading and unloading work, to provide security, traffic regulation, and also to support the troops operating in the base which do not have organic supply forces and means. The battalion can load and unload up to 7,500 tons of cargo in a day, and also can accomplish up to 2,500 cubic meters of field engineering work. Motor transport brigades are employed to transport supplies, evacuate and provide other types of transport services in accordance with the plan of the front rear services staff. These brigades provide transportation services between the rear front base and the forward front bases. A motor transport brigade can lift 6,600 tons of cargo, including 1,440 tons of POL, in one trip. The brigade is organized into three motor transport battalions, one heavy motor transport battalion, two POL transport battalions, a service company, mobile maintenance shops and medical center. Such brigades are employed to prepare and restore the motor communications routes of the front and to provide traffic control and regulation along the routes. The capacity of one road construction and commandant's service traffic control brigade is 900 km, which means that along this distance, it can provide for the repair of the roads as well as traffic control and signal communications. The brigade is organized into the brigade headquarters, three road construction, traffic control, and commandant's service battalions, one independent road construction battalion, one independent bridging battalion, one independent special bridging battalion, signal platoon, reconnaissance platoon, chemical protection platoon, repair shop, etc. 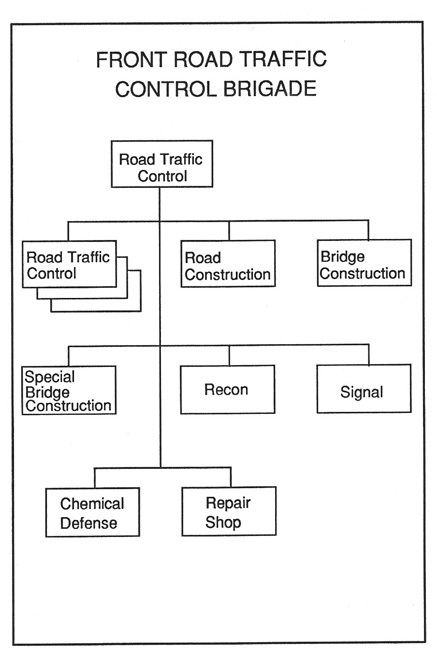 One to three road construction traffic control and commandant's service brigades can be in the composition of the front rear services. 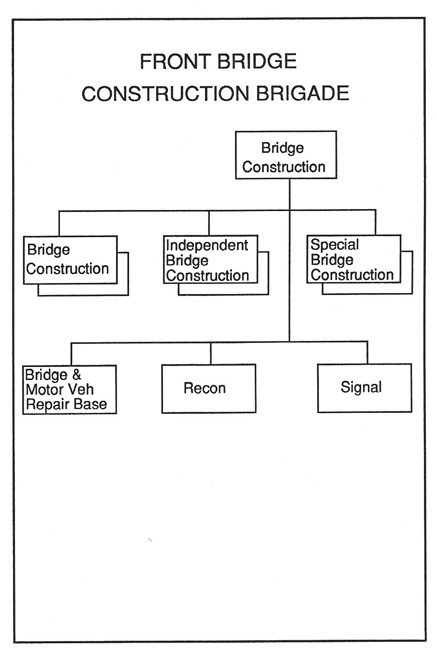 The bridge construction brigade is part of a central reserve and is employed to reinforce the active operations of the fronts. Its mission is to construct crossings over the wide rivers which link motor routes. The brigade is organized into a brigade headquarters, two bridge construction battalions, two independent bridging battalions, two special bridge construction battalions, a bridge and machinery repair base, reconnaissance platoon, signal platoon, and etc. The pipeline brigades are designated to provide POL transport through field pipelines. One to two pipeline brigades may be found in the front. Each brigade can establish 600 km of pipeline. 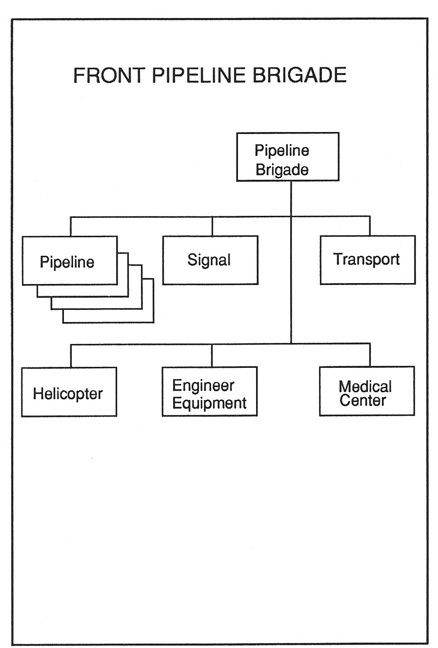 The pipeline brigade is organized into four independent pipeline battalions, independent signal battalion, independent motor transport battalion, independent engineer and technical company, helicopter company, medical center etc. The brigade, in a 24 hour period, can transport up to 800 tons of fuel by using 100 mm pipelines, and 2,000 tons of fuel by using 150 mm pipelines, for a distance of 75-150 km, and also can construct 65-75 km of pipeline. The battalion is organized into three rocket fuel transport companies, mobile motor vehicles maintenance shop, and a signal platoon. The battalion can lift, in one trip 640 tons of rocket fuel. The front's rocket fuel depots are designated to hold rocket fuel reserves at the front level. Each depot can hold up to 500 cubic meters of rocket fuel. Ambulance battalions are designated to evacuate wounded and sick at the front and army levels and also to transport the hospital installations to specified areas. Their number is normally dependent on the number of the forward front hospital bases. An ambulance battalion can carry up to 3,000 wounded and sick in one trip. The battalion is organized into two ambulance companies, hospital transportation company, mobile maintenance workshop, medical center and supply platoon. The air ambulance regiment is assigned to evacuate critically wounded and sick. It is organized into three squadrons with a total of 32 AN-26. The regiment can airlift in one trip 180 casualties. - mobile signal repair shop. 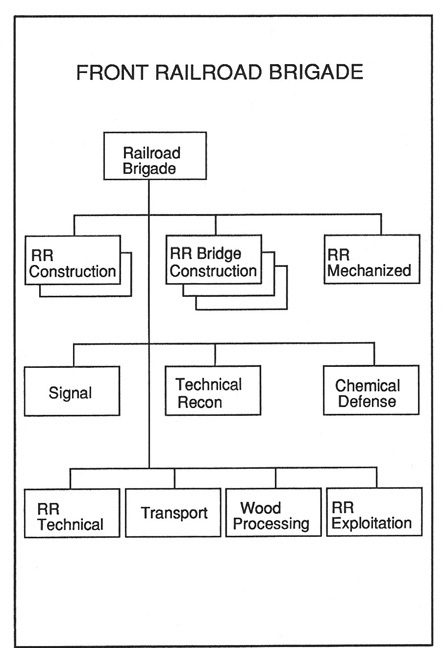 Railroad brigades are designated to establish or restore front railroads. A railroad brigade is organized into a brigade headquarters, two railroad construction battalions, three railroad bridge construction battalions, independent mechanized railroad battalion, independent railroad signal communications battalion, independent railroad technical battalion, independent motor transport battalion, independent wood preparation battalion, independent railroad exploitation company, technical reconnaissance company, chemical protection company, etc. The regiment is intended for the exploitation and use of individual areas of the front railroads. It is organized into two movement battalions, one steam engine battalion, a service battalion, and a signal company. The railroad bridge construction regiment is assigned to restore large railroad bridges in support of front operations. The regiment is organized into two bridge construction battalions, one technical battalion, and a material preparation company. The signal regiment organic to the front rear services establishes signal communications between the front rear command posts and the rear command posts of the armies and large units, as well as with large units and units of the front rear services. The regiment has two signal battalions. - organization of POW camps and guarding the camps. - the development of mobility and maneuverability of the rear service, reflected in the fact that the forward front base, the forward front hospital bases, and other elements are organized as mobile formations. - the requirement that the organization of rear services support should insure the combat actions of the troops with or without the employment of nuclear weapons. - in operational formations of the ground forces rear service support should be organized in the interest of all troops participating with them in the operation. The rear is the grouping of rear services forces and means assigned to conduct rear service support of the troops in the operation. The deployment of the front rear services echelon is conducted in the framework of plans prepared in advance. It includes the transition of the rear services echelon from peacetime to wartime status through mobilization of rear services elements which is normally carried out concurrently with the deployment of the combat forces organic to the front. The process includes upgrading all rear services echelons to a state of full combat readiness, mobilization of rear services, movement of additional logistical support units, large units and installations, supplies and stores to the theater of action and the deployment of the rear services echelon in accordance with the requirements set for the logistic support of combat actions in specific situations. The operational organization of the rear services is the grouping of rear services troops and means into a structure organized to provide rear service support to the troops. In front offensive operations the grouping of rear services forces and means is established in echelons, within the limits of the rear services area along the main directions of troop actions. The front's forward rear service base is relocated once every three days, when the speed of attack is 40 - 60 kilometers per day; so that its distance from the army's mobile base should not exceed 150 km, which is a half-day march by the front's transport vehicles. The front rear services deploy and operate in the front's rear area. The boundaries of the front rear area are defined as follows: at the flanks, by the boundaries with adjacent fronts; at the rear, by the rear boundary of the front specified in the directive of the commander-in-chief; and forward by the rear boundaries of armies' mobile bases. In the (iskhodniye nastupatelhaya rayon), the forming up position for the attack, the depth of the front's rear area reaches up to 300-400 km, while in the course of the offensive operations it may increase to 800-900 or more. The front rear services elements deploy in echelons throughout the depth of the rear services area on the main axes of combat operations. Their main efforts are allocated in support of the troops conducting the main attack. Depending on their missions, mobility, and method of operation, front rear services units, large units, and installations are grouped into two echelons, i.e., the forward echelon and the second-echelon of the front's rear services. - front mobile repair units and installations, etc. In the forming up position for the attack the units and installations included in front rear service forward echelon are grouped in accordance with the axes of the first-echelon armies' operations. If the available rear services forces and means are not sufficient, a single grouping is established to support two adjacent armies. The forward front's bases are deployed close to the railroads at a distance of 80-100 km from the mobile army bases. To ensure the dispersed deployment of the forward front base, an area of 150 sq km is required for its deployment. When the front has only one forward base, it is recommended that it deploy in two locations. The bulk of its elements should deploy to support the troops operating in the direction of the main attack and a branch of the base should deploy to support the troops conducting supporting attacks. The front's rocket technical units are deployed in accordance with the grouping of rocket troops. Usually the mobile rocket technical bases of the front deploy at the beginning of the operation at a distance of 30-40 km from the location of the front's rocket brigade, while the independent rocket park battalion deploys 10-15 km apart from the unloading stations, ports, and supply airfields. The rocket fuel depots and rocket fuel transportation units deploy close to the unloading stations and supply airfields. Branches of rocket fuel depots are moved forward to be at a distance of not more than 50-70 km from rocket engineering technical bases. - the independent medical detachments deploy close to the first-echelon troops as well as near the front's reserves. this is done in situations when eliminating the impact of enemy nuclear attacks may become necessary. Under all circumstances, at the beginning of the operation, the number of medical installations deployed in the area of each first-echelon army is calculated to the able to deal with the treatment of all casualties received during the first two or three days of the operation. The pipeline brigades are deployed to provide for the flow of POL from the permanent POL depots as well as from the front's POL depots to the troops operating in the main grouping of the front elements. If two pipeline brigades are available in the front, a number of pipelines can be established on one or two axes of the attack. The main field pipelines are also used to transport air forces' fuel to the airfields, to transport POL across rivers, and to bypass the destruction of railroad centers, and also to disperse POL reserves from large depots. The front's mobile repair units move in army areas at the beginning of the operation or they are attached to the armies. - repair shops and other units and installations deployed to the rear of the front rear service areas. The depots of the rear front base are deployed in echelons along the railroads. The stationary depots are located in the front's rear area with their materiel reserves subordinated to the rear front base. 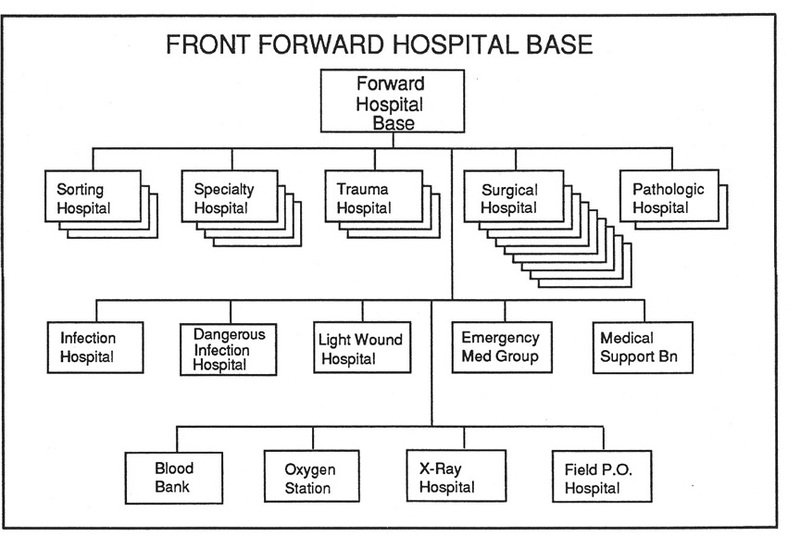 The order of deployment of front bases depends on their number and the time of their arrival in the front. Moreover, the locations of their deployment should be in accordance with the locations of deployment of forward front bases and their branches. For example, if at the beginning of the operation, there is only one rear front base available, then its recommended breakdown should allow its main part to be deployed on the main rail head and a branch of the base to be allocated to another axis. In addition a second branch of the base is kept in reserve, for temporary deployment in the loading area or ready to move to an important railroad extension area. If two rear front bases are available in the front, then each one deploys on one or two railroad axes. In this case a branch of the rear front base should deploy in an area 120-150 km from the forward edge of the battle area, while a second branch should be kept in reserve to be moved during the operation. 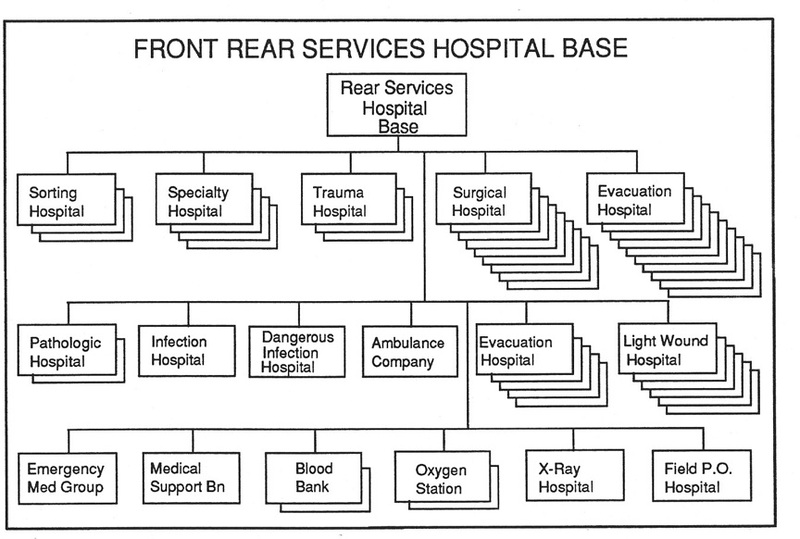 As the experience of field exercises indicates, it is better that the rear front hospital bases deploy in two to three locations on the main railroad axes. Depending on their missions and the availability of bases, their distance from the FEBA can be from 50-70 km up to 200-300 km. The repair shops are deployed close to the rear front bases and local repair facilities are also used if possible. Rear services units and installations arriving during the operation are deployed in appropriate areas. Depending on their missions, they should be deployed on major railroad links or they should be included in the composition of the first-echelon of the front's rear services and deployed accordingly. Therefore, in the forming up position for the attack, the rear services units and installations with less mobility -- the operation of which is closely dependent on, and connected with, railroad movement -- should be deployed first, while the mobile units and installations should be kept prepared to move and follow attacking troops during the operation. For this purpose they should stay close to the armies which they support. The movement and relocation of front rear services large units, units, and installations in the course of the operation is dependent on the rate of advance of attacking elements and the situation. In principal the distance of the forward echelon of front rear services from the armies' rear services large units, units, and installations should not exceed half-a-day's march by transportation means, which is about 150 km. This will ensure daily resupply of the army's exhausted materiel reserves and also will facilitate timely medical aid to the wounded and sick and their evacuation. It will also insure timely recovery, repair, and restoration of damaged vehicles. In such cases the army's mobile bases will not be able to follow closely behind the attacking elements, and may be left behind at a distance of 100-200 km. Therefore the armies' transportation means may be employed to move the supplies from the forward front bases, and troops transportation means may be used to move supplies from the army's mobile bases. Forward front bases should follow the first-echelon armies. The distance between the forward front bases and their branches and the army's mobile base should not exceed 150 km. Therefore when the rate of advance is 45-50 km a day, the forward front bases and their branches should move once every three days. When the rate of advance is 80-100 km per day, they should move once a day or once every two days. The forward front bases may relocate in their entire strength, or they may conduct alternate movement by moving their branches first and following them with the bulk of the base. Frequent movement of forward front base is desirable, but this may decrease its capabilities and will require a large amount of transport means in its movement. The front's mobile rocket technical bases follow the attacking troops in bounds of 150-200 km, and the independent rocket park battalions conduct relocation in accordance with the extension and restoration of railroads and the establishment of new materiel support airfields. The rocket fuel depots and their branches usually move together with the mobile rocket technical bases. The forward front hospital bases move to the massive casualty areas and deploy at a distance of 40-50 km from the FEBA. Mobile repair units move to the areas where a large number of damaged vehicles are collected. The rear service large units, units, and installations included in front rear services second-echelon move in accordance with the preparation of railroad lines. The rear front base, during the operation, detaches its branches to areas where railroad construction is completed, and sometimes it moves on motor routes in the absence of railroads. In such cases it should be provided with additional motor transport means. All elements of the rear front base completely relocate only at the end of the front's offensive operation. 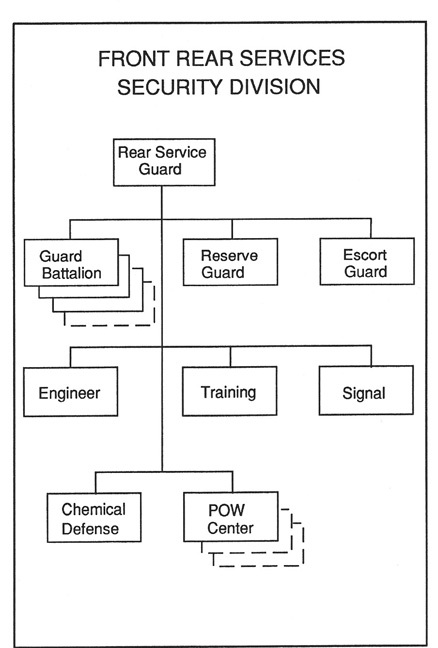 The plan of rear services support, in the interest of the front's troops is a part of the front's operations plan. Therefore the requirements pertaining to any command and control document are also applicable to the plan of rear services support. The plan should be concise and clear. The conciseness of the plan is achieved by including only the most important matters concerning the organization of rear services support. The clarity of the plan is achieved by precisely reflecting the special symbols of the rear services, of supply routes, and transportation means, and also by providing the most effective data tables in the plan. The plan of rear services support should be organized in complete conformity with the concept of the operations and the missions of the troops. The contents of the rear services support plan include all matters concerning rear service support of the troops handled by the deputy front commander for rear services and the service chiefs. The plan also includes issues of supplying the troops with ammunition, vehicles, and technical equipment, since the deputy front commander for rear services is responsible for their timely supply. The supply of the troops with rockets and their movement by specialized transportation means, technical support of armament, armored vehicle support, motor and tractor and other equipment support are reflected in other plans prepared by the chiefs of the front's services who are not subordinate to the deputy front commander for rear service support. - the basic missions of front's rear services. - protection, security and defense of the front rear. - the tables of the rear services support plan should be worked out in a format which can be used in computers. 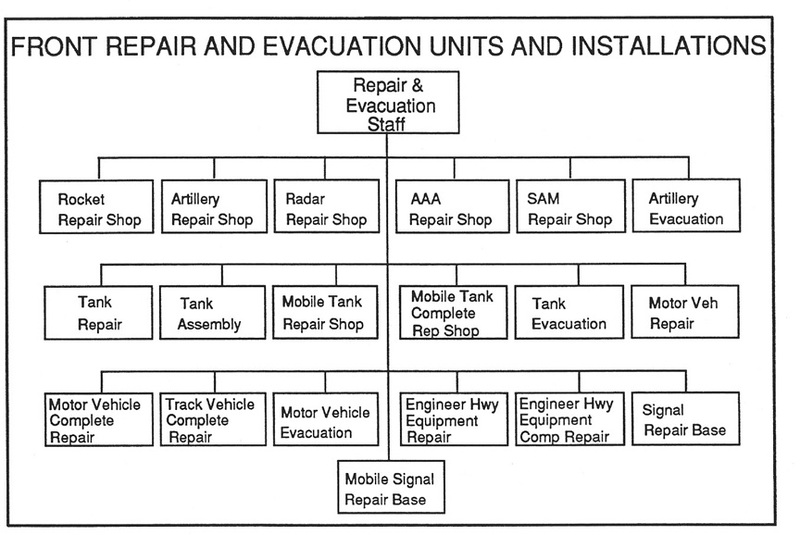 The front's rear services support plan is prepared on a map with written instructions, or it can be prepared in written form with a map annex. The plan is signed by the chief of the front rear services and his chief of staff. It is coordinated with the front's chief of staff and approved by the front commander. - information about the composition, deployment, mobilization, status, and location of operational rear services. The directives of the Armed Forces General Staff constitute the basis for planning and, without waiting for the other information, the preparations for planning should begin once the directive is received. The commander's decision and his instructions on rear services support are supplemented by other initial data in planning the rear service support for the front's offensive operation. - transloading from one vehicle to another should be avoided. - up to 10% by pipeline. -300 km for transport vehicles of front. - the management of rear services means should be carried out in such a manner that all the units participating in a given operation might profit from such support. - establishing the rear services is based on the commander's decision within the specific operation, with consideration given to the existing situation. Tailoring the rear services is based on the grouping of the forces. The plan for rear service support is part of an overall operational plan. The rear service support plan presents the same requirements as all the other troop control documents. Conciseness of the rear services support plan may be achieved by applying the salient features of rear service management. Clarity of the plan may be achieved by careful usage of rear service symbols and of clear marking of principal truck routes, as well as through the use of charts and diagrams. The rear service plan will be based completely on the overall concept of the operation and the mission of the forces. The plan's content will include items relevant to the rear service support of the forces as prescribed by the deputy commander for rear services and other subordinate services. The plan also gives special consideration to the support of the forces with ammunition and technical equipment (all the items are specified in terms of palletable units and tonnages). The deputy commander for rear services is responsible for timely supply to the forces. Missile supply and transport by special vehicles, supply of technical weapons, supply of armored, armored tracked, and other vehicles, are specified in a separate plan of the chiefs-of-services subordinate to the deputy commander for rear services. - management of front rear service troop control. - the various aspects of the rear service tasks will be reflected in separate plans (e.g. the supply, storage, and dispersal plan, the securing of supplies, the rear service support of air, airborne and amphibious operations, and regrouping). - the rear service support plan is prepared with the use of an overlay as well as written comments, or in a narrative form with a map annex. The plan will be signed by the rear services chief of staff as well as the chief of rear services and must be coordinated with the chief of staff of the front and authenticated by the front commander. - the location and sites of the technical battalions of SAM regiments. - arrangement for the change of positions, etc. In order to insure a more efficient organization of supply in support of front operational formation's, it is mandatory that reserves of material means are constantly delivered close to the armies. This means that front forward bases are constantly moved forward. In this case the armies transport their own material means, or material may be delivered to them by front transport means. - front transport means 300 km. - additional transportation (from one vehicle to another) must be avoided as much as possible, since this may cause loss of time and waste of effort in loading and unloading personnel. Supply is planned by the front's rear service staff with the participation of military communication service, food, clothing, motor and tractor, POL, and other services. - foodstuff 30 daily rations. Medical support is the organization and conduct of medical treatment and evacuation and issues related to hygiene and antiepidemic measures. The main principle of medical support is bringing the medical installation as close to the massive personnel casualty areas as possible. In other words the medical support must be conducted on site. During the organization of medical support it is mandatory that likely personnel casualties, types of diseases, and the capability of medical installations are taken into account. A large number of casualties are expected during the initial nuclear strike. These casualties will account for thirty percent of all casualties. During nuclear mass and group strikes, personnel casualties may reach up to four percent per day. In operations conducted without nuclear weapons the overall casualties during front offensive operations will be 12-13.5% (an average of 0.8-0.9). On the basis of such numbers of casualties 120,000-130,000 hospital beds are needed including 40,000-50,000 beds at the beginning of the operation. Such large numbers of hospital beds are not available in the front, therefore, each available bed is expanded into two beds to meet the requirements of likely casualties. Wounded are evacuated from separate medical detachments and divisional medical battalions to front hospital bases. The evacuation is conducted by army and front ambulances and in some cases by air transport means. The front's hospital bases must deploy in such a way that the distance covered by evacuating vehicles carrying wounded and sick, is not more than 120-150 km, allowing the ambulances to move them to medical bases in 5-6 hours. Communications routes are one of the most important elements in an offensive operation. In offensive operations the front will use all available routes (railroads, waterways, airways, roads, pipelines). Railroads: In the front area, there should always be available two to three frontal and two to three lateral (rocade) railroads with a capability of handling 70 round trip trains (para poyezdov) within 24-hours. In the course of an operation, one to two railheads will be established, which should increase the capacity by up to 30 round-trip trains. The speed of laying a railroad with two brigades may be may up to 40-45 km within 24 hours. In case of total or massive destruction, this figure should be cut in half to 20-22 km per 24 hours. At the Field Army echelon: All types of access routes will be used in the course of an operation; as well as all types of transport vehicles such as railways, highways, waterways, and pipelines. Two to three rocade rail lines and two to three railroads perpendicular to the FEBA will be laid. Their capacity will be approximately 60-70 round-trip trains. One-to-two railheads will be established with a capacity of twenty to thirty roundtrip trains. The above will depend upon the availability of railroad brigades at front. Two-to-three R/S distribution stations (raspredelitel'nyye stantsii) will be established and R/P distribution ports will be designated on the waterways. For the movement of the forces and for the transportation of supplies by motor vehicles, frontal truck routes (Frontovaya voyennoavtomobilnaya doroga) will be designated leading from front bases to field army bases. The capabilities of the railroad brigades include 20-25 km of construction within 24-hours or nine km under conditions of massive destruction. Two to three distribution stations as well as two in reserve may be allocated per field army. Also, per field army, the following unloading stations may be allocated: one per division; two to three per field army mobile base. Temporary unloading sites: one-to-two per front. Waterways: per front, one distribution port (raspredelitel/nyye porty - V/P) and for the field army one unloading point will be allocated. Military Motor Vehicle Routes: (Frontovyye voyenno-avtomobil/nyye dorogy - FVAD): will connect front bases with their sections and their sections with the field army mobile bases. One FVAD will be established behind every first-echelon army. Its capability should be up to l0,000 motor vehicles per 24-hours. Field main pipeline (Polevoy magistral'nyy trubovod - PMT): Its mission is to bring in POL from permanent depots and front depots to the main concentration of front forces. It is laid in the direction of the main attack. Air Transport of Supplies (Aerodromno-materiyal'noye obespecheniye - AMO): It is organized to provide supply support through airfields. There will be seven or eight such airfields to provide supply support per front. Arrangements will be made to exploit all kinds of transport completely. For this purpose, a network of supply routes will be established and technical cover provided. - it can repair pavement up to l0 km. The establishment of the front rear services depends upon the conditions under which the defensive posture is assumed, types of weapons to be employed, mission of the front and the order of battle. The front rear area will be designated for the deployment of the front rear services. Its size is not prescribed and may extend to the depth of up to 500 km. The possibilities of initiating offensive action by the front forces without delay will be taken into consideration. The preparation of the rear service units and installations for their mission of supporting the forces in an operation consists of the following: providing rear service units and installations with personnel replacements and with technical means and materials, the conduct of training (combat, political and special), and the preparation and readiness of rear service technical units for the accomplishment of their mission. The governing principles of rear service management of front forces in a defensive operation and management of rear services depend on the circumstances under which the defensive posture had to be assumed by the forces and upon the types of weapons used by the belligerent forces. In comparison with an offensive situation, the composition of rear service forces in front defense is rather limited. If, in the course of operations, the front is forced to assume a defensive posture, it will probably be the result of having suffered numerous casualties; also, the levels of supply storage will be low. Hospitals will be filled with casualties. In the case in which the front goes over to defensive positions prepared in advance, rear services forces, according to plan, would deploy rapidly and the levels of supply would be high. The establishment of front rear services in defensive operations depends on conditions for assuming the defense, types of weapons to be used (nuclear or conventional), front missions, and front defensive layouts (formations). To deploy the front's rear service, a rear service area is designated, the dimension of which is not standard. The depth of this area may reach up to 500 km and its flanks are marked by the front's boundaries. 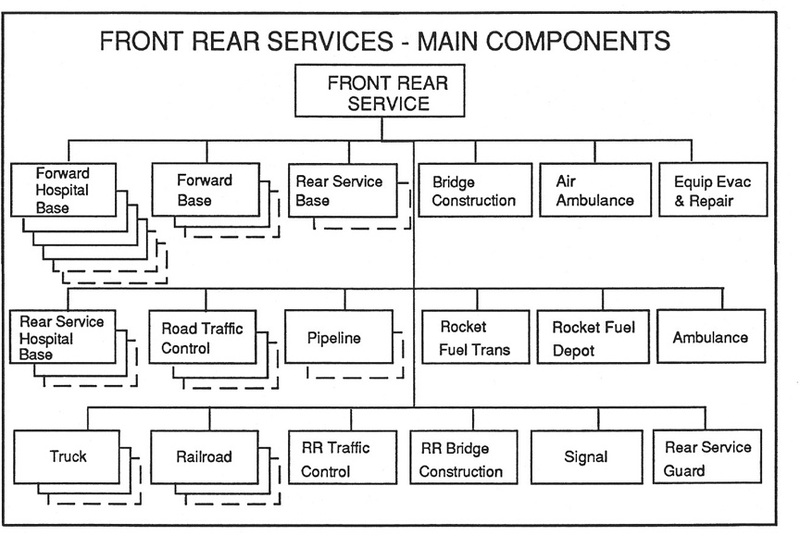 The depth of the front rear service area is usually specified in the directive from the general staff. The rear service units and installations are dispersely deployed in the directions of actions of the troops echeloned in terms of depth and across the front. The rear service units and installations are deployed far from potential targets of enemy nuclear weapons and out on the flank of the enemy's main attack. The rear service units and installations are assigned main and alternate areas for deployment. Sections of front's rear base are deployed at a distance of 150-200 km from the forward line. In defense it is required that reserves of rear service units and installations be established. Front rocket technical bases are deployed at a distance of 30-40 km from the "start" positions of rocket brigades. - aviation technical support regiments (the number of which depends on the number of aviation divisions in the air army). - separate aviation technical support companies (ORTO), the number of such companies in the air army is the same as the number of separate aviation squadrons in the air army.